Hi. I'm Quin and I'm one of the kid volunteers. Our team has been really busy for the past 5 days examining kids in the orphanage and helping the teachers and nannies learn therapy techniques. Here I am in one of the therapy rooms playing with a little girl who has Down syndrome. Children who are born with Down syndrome can really be helped with therapy and they are really fun! I am helping this little girl learn how to share toys. She gets to hear music for 15 minutes which helps her brain become more organized. In the second picture she has on earphones tied with a red scarf. At first she didn't like it but when she heard the music it helped her concentrate better. The little boy in the last photo has a hard time using his muscles. The big therapy ball helps him have fun and stretch while reaching for toys. The kids really like therapy. This orphanage has almost 400 children. Some of the kids will be adopted by parents in the United States and Europe. It's nice for kids to be able to have fun while they get their therapy. This school was built 7 years ago in only 14 months. It is a government run boarding school with an emphasis on a foreign language. There are 3500 students here in grades 7-12. It is one of the top schools in the area with only 1 of every 100 elementary students getting in. The lower grades pay a lesser fee than grades 10 – 12. At the end of their 10th grade year they make a choice between the science and math area or history and social studies area. Graduating from this school eliminates them from taking the tough entrance exam for entrance into the local universities. This was the deal the government made with the colleges. How about this for a school day!! Breakfast is around 7:15 am and classes start @ 7:40 am and run till noon. Much like in the US school system (about the only similar item) the lunch program runs the school. The Jr. High kids eat @ 11:30 and the Sr. High around noon. They have about an 1 ½ hour lunch break and then back to classes till 5:00 pm..Supper is served and then back to study areas from 6:20 to 8:40 for Jr. High and till 9:20 for High School..Lights out @ 10:00 pm for the Sr. High kids, a bit earlier for the younger ones. Sports or clubs take place in the late afternoon. There is no competition between other schools as it would cut into study time. Basketball is big here among the students as a sport and they like the NBA, especially the Lakers. We told them the Lakers were originally from Minnesota, the land of 10,000 lakes, and city of Minneapolis, the city of Lakes. The campus would be a large version of St. Olaf or Gustavus. The mulit-storied ( a 3 story cafeteria) buildings have marble stairways with stainless steel handrails, no carpet here. The huge gym would rival the Target Center and many outdoor basketball courts ring the campus. Expansive walkways, and landscaping is set around ponds, shrubs and trees. The architecture is creative the library looming over a huge granite football like courtyard. 20% of these kids go onto Universities all over the world without having to take the college exams. There were lists of the student’s names with the college acceptances next to their names. One had 9 schools.. from the Big Ten, California, Ivy League to schools in Europe. About 40-50% go onto colleges in China with vo-tech schools being an option. This is a brain factory. They want to be here and I am sure the principal deals with few discipline problems. The director said “If a kid came home from school @ 3:00 pm., he /she would be shot by the parents.” Education here is big time and I feel the game is over. China wins. I talked to a student for about 15 minutes and within 12 hours he had emailed me. He was interested in the most fantastic sport in the US, who was the most famous American author and had I been to a NBA game. I gave him my answers and told him I’d take him a game if he came to America. My bet is he will be over, these kids are driven..Fun to see this. The year sure went by fast. For two years in a row now, two Libra members of our team...Tim and Bridget... got to celebrate their birthdays at Hangzhou CWI. After a morning of examining around 20 kidlets, the staff had a giant cake delivered to our cafeteria. What a gift to see all the foster families including PT and OT into the childrens' daily regimen. Kudos! Later this evening we are scheduled to celebrate at a Karoke bar somewhere near the night market in Hangzhou....more to come. Today we spent the day examining 22 children. It was so touching to see their sweet smiling...and sometimes crying...faces. We sure were busy! Every one of the volunteers did a fantastic job! Thank you to all! As so many children are now being adopted internationally and domestically, the nannies frequently asked...Do you think this child could be adopted internationally? Oh my goodness...of course! 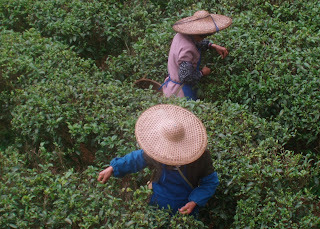 On Wednesday, Oct 20th, around 5:00 pm we headed for the tea area of Hangzhou, (Longjing) green tea, one of China's most prized teas has long been cultivated in this area on the jagged hills that border Hangzhou. Our driver weaved up the hills and narrow streets and wedged us in a side street.We then walked for about 10 minutes down a steep walkway, past houses with patios and gardens, finally to our destination. We were at a family's house and sat out on their deck. They had just remodeled their place and it was fantastic. It had the traditional furniture inside and put a brand new TV set up attached to stone wall. The food kept coming out once again and we really had a good time. At the end the family got out the tea and many of us bought some. According to legend Emperor Qian Long decided this tea from the Meijiawu Village was the best in China. So of all the tea in China..we bought the best...So I got that going for me when I return to the US. The leaves were hand dried and recently picked. We left there about 9:00 pm and got back in a short time, traveling thru several tunnels that were cut thru the mountains. Our bus is a 20 passenger Mercedes with a stub nose, manual shift and comfortable seats. Our driver is a magician weaving us in a and out of traffic, pulling in a front of anyone, turning on a dime and suddenly stopping inches in front of a car, bus, bike or wide eyed pedestrian. There are no rules here, only if you are in a bigger rig you win. He made a U-turn in front of oncoming traffic, forced taxis and bikes off the road and always won the race to the spot. He was like Rembrandt at times gently weaving in and out with smooth stroke of the gas pedal and turn of the wheel, other times like Picasso suddenly stopping and turning and squeezing in next to another bus, and other times like the mad man Van Gogh racing down a short cut, thru a back road and scattering folks and bikes to the curb. 90% of the time he is only inches from the the other buses, bikes and taxis. His horn blares to warn and he never gets upset. He passed a cop on the right with his horn blaring, dodging another car and settling in front of the cop. There are no tickets given or police present, it would only stop the uncontrolled flow of the vehicles. I have come to the conclusion this traffic only works if there are no rules. A left turn only lane with people obeying would only cause a back up, so it is better to head out into the flow, melt in and keep going. So I just seat back and marvel at the master driver in action and am glad I am not behind the wheel. At 8:30 am we left for the Terracotta Warriors, thought to be the 8th Wonder of the World. It was about an hour drive outside of the city of Xi'an and once again dodging traffic and stopping to pay tolls along the way. On March 29th, 1974 a farmer digging a well because of the drought discovered some pottery and reported it the authorities. These four farmers became instant heroes as they had discovered Emperor Qin's tomb from 2,000 years ago. I will not go into all the details of him, but google Terracotta Warriors. This cruel emperor had died at the age of 50, but made his people build him a tomb. The warriors were to protect him, and some 700,000 died building his tomb. 8,000 lifelike warriors, all different, were made to honor and protect him. The site was sacked in a revolution (many sites in China have been sacked and the rebuilt), taking a month to rob. His tomb remains untouched as authorities are trying to develop the technology to preserve and dodge the booby traps set; some even with mercury. In the three pits we toured, the the remains were re-constructed. In 1998 Bill Clinton visited the site and met one of the farmers who made the discovery. One is still living today and was present to sign a book when we visited and Cheryl bought a book and had him sign it. It was a site almost too big and unreal to imagine. We had gone to bed early after our hike around West Lake and another marvelous meal. I can't seem to say no to the food presented to me. My use of chopsticks is getting pretty good and not much gets by me or is left on my plate. Quinn is the best at the use of chopsticks and have given me a few pointers. Getting the noodles out of the bowl is a test, as they are easily 17 - 18 inches long. 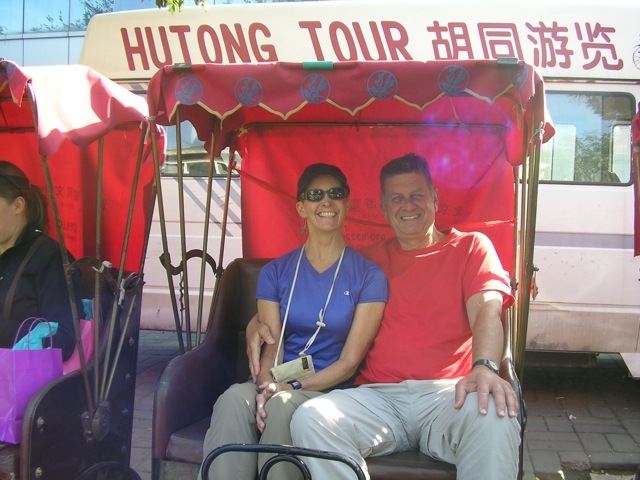 Our bus driver took us to the West Lake area where there are many Pagodas, park areas, and a favorite romantic spot for all. Needless to the place was packed with people on Sunday. The Baochu Pogoda built in 976 is the center of the Buddhist Culture and was one of our first stops. This also the spot of the Lingyin Scenic Area, one of the ten largest Buddhist Temples, 1st built in 326 AD. The Lingyin Pagoda is the only Pagoda in Hangzhou that dates back to the Ming Dynasty. This is one of the most popular spots for Buddhist activity in SE China. There were tons of people worshiping here along with the visitors and tourists. Incense was all over the place and at times the smoke almost burned your eyes. After lunch we took a boat ride across to an island dotted with paths, walkways, and bridges. The winding bridge walkway was made of granite slabs 2' by 6' and 6 inches deep.. and 3 wide. This was set on concrete columns with precision craftsmanship and made for comfortable walking. The boat took us back and we headed to the spot to be picked up. The area would be like Lake Calhoun but set it in a city of 10 million, with clogged paths and roads. We looked across the way at the Shang Ra La Hotel, the old communist state Guesthouse where President Nixon stayed in 1972. A night's stay would run you $160 a night. The train station is Beijing was packed with people, some workers,and some migrant workers. Luckily Nancy and Danling guided us through the gates and onto the platform WE were scheduled to leave @ 9:00 pm and made it despite the traffic and flood of people going thru the gates. 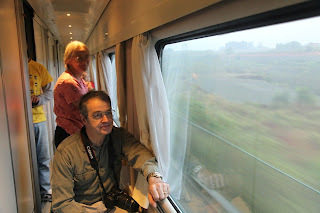 I was the odd man out of 13, so I shared a berth on the sleeper train with a husband and wife from France and I fellow visiting famly in Xi'an. With my snoring the other 12 in our group caught a break. There was no common car for hanging out, just a washroom or bathroom at each end of the car. 4 to a room with 10 berths per car, giving us about 600 on the train. The high speed trains only go halfway and in the 2 years will cover the total distance between Beijing and Xian. We had an 11 hour trip. In my bed I was awakened by a photo flash of light, preceded by light horn. It was a high speed train rattling by like a bunch of flourescent lighs exploding. This happened many times and also with oncoming traffic. Thank goodness I was not on the top bunk as two footholds on each side was all you had to use to get up. It was pleasant after a bit with the thump-thump of the train and the roaring sound of the trains passing, almost in another world as I dozed on and off. We all made it thru the night and arrived in Xi'an missing the early rain that hit. 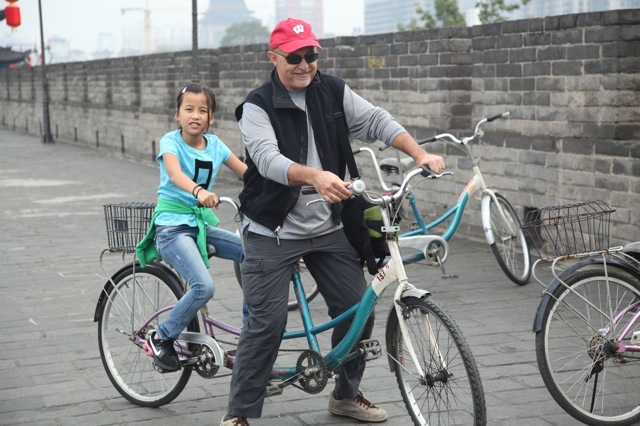 After biking and touring the Wild Goose Pagoda and taking in a caligraphy Museum wer were dropped off a our restaurant Our bus driver pulled right up on to the sidewalk as people flew out of the way. The brakes squeaked, the door opened and yours truly led the charge to the buffet, first stopping at the restroom..another story..here. Xi'an is a dry region and wheat and corn are the main crops. 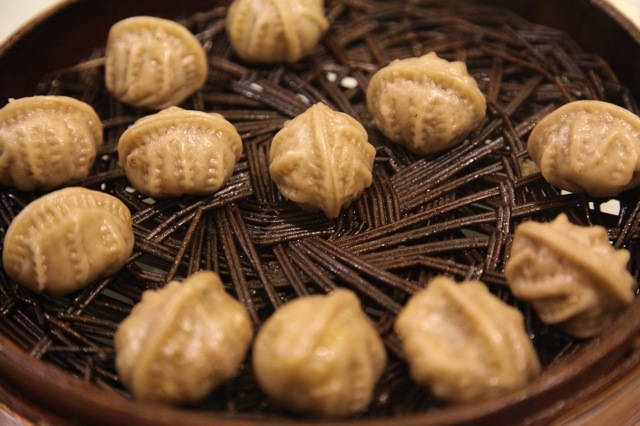 Dumplings are a main staple, not rice. Dumplings are made with a wheat dough, rolled out and then stuffed with fish, pork, beef, ham, mushrooms, duck and even peanuts. Ours were made in the shape of ducks and walnuts even. They are then steamed, sometimes fried and served up on a lazy Susan. Needless to say it made many stops in front of me. The dumplings wer outstanndinnggg!! and about the size of mini donuts. They kept bringing them, a total of 15 different kinds. This was preceded by the servings of duck, pork and chicken and ending by a mini-dumpling soup. I needed one of the cranes to lift me out of my seat after. Our guide, Mini took us to the City Wall which was real close to to our hotel, the Howard Johnson Plaza. We made the choice to bike the entire 9 mile square. Tim and Quinn were on a tandem, Linda and I also for about 15 min, Jane, Kim and Bridjet on single bikes. These bikes look like they were about 40 years old, with 1 speed, hand brakes, a wire basket on top of rusted, rattling fender. But they worked!!.. Linda and I switched to single as her seat was about 2 feet off the ground. The streets below were filled with traffic but up above on the wall it was clear sailing. What a site we have over the the bumpy cobblestone top, past ancient weapons of catapults, cannons and lookouts. The whole time we were watched by huge tower cranes overlooking the city of Xi'an (8 million)..Xi'an is trying to maintain the old look but skyscrapers are everywhere outside the city wall. Some of the projects are being approached with pick and shovel nd getting roads opened up is not easy. The whole time we saw new and different sites on the roof tops. 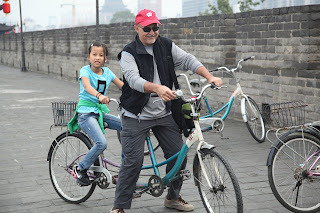 It was indeed a ride of a life time shared with old friends, new friends and my wife of 39 years. We had a tour through the Hutong district via rickshaw on Tuesday. It took us thru the alleys of households that date back to the Ming Dynasty. This was a chance to see the ancient lifestyle that still exists, despite the Olympic building program that demolished many of the buildings to make way for the high -rises. Later we had lunch with a family. A fantastic meal set on a lazy Susan. Needless to say it made many stops in front of me. Tian'men Square is the largest public square in world. The square was filled with people and guards scattered through out the area. The size of the area is staggering and the huge screen was the one seen during the Olympics. Forbidden CIty is across the from the square. Once again it is massive. Commoners were forbidden to enter and were punished by death if they entered. It was home to many on Ming and Qing dynasty emperors till the end of the Ming Dynasty in 1911. A day here might not be enough to see all the courtyards and art collections. Hi All. I just want to say how happy we all are that the trapped miners in Chile are now being rescued. We are in our hotel in Xian watching the breaking news on CNN and waiting to go outside and see the sights. I'm so happy to be getting messages from parents adopting children from Hangzhou CWI. Our team is thrilled to be seeing and evaluating the kids in a few days. So many kids are already familiar to us as we were priviledged to examine and give suggestions a year ago. A few parents have already brought their children home! I recently received an email from a mom who said, "I am so happy I accepted the referral on this little girl. She has enriched all of our lives tremendously. She loves to be kissed and give kisses too." Isn't that a wonderful email to get. We passed the Drum Tower on the way out of Beijing on the way to the Great Wall. Our hotel, the Beijing Oriental Cultural Center is in the center of Beijing, marked by the inner ring of roads which there are a total of 6 rings..farther out are the more modern skyscrapers and such. We got the Great Wall around 11:15 am on a clear, spectacular day. We were lucky as the previous days were cloudy and rainy..We visited the Badlaling section, the most frequented area, the first area to be restored in 1957. Mao Zedong said "He who has not climbed the Great Wall is not a true man." The wall is 3,875 miles in length, but if you include all terrain and berm it is over 10,000 miles. Most of the wall is in poor condition and many parts are not easy to reach. We were amazed at how steep the steps were, with the flat stones not easy to climb. The walls are higher on the invading side and have more holes in for looking out and weapons and such. In walking were over overtaken by the vastness and overwhelming area it covered. Smoke was used to alert the troops if an invasion from the north was on its way. The wall was wide enough to allow horses and troops to move the point of action. We took many photos and will have them loaded on our Picasa album soon. Our trip has started out with spectacular weather, amazing food and wonderful companionship. Some of our volunteers will be leaving in a few hours for China. It's just going to be wonderful seeing the kids again! So many children have been adopted since last year and the parents who have contacted me are over the moon! Overwhelmingly, the children have adapted into their life like they've always been there. I credit the great work of so many Chinese foster parents, making it possible for a child to learn life skills in a family while waiting for their adoptive parents. Children's Home Society and Family Services went to China in March 2010 to work with an orphanage in the Journey of Hope Program. Many of these children now have loving families anxiously waiting travel approval... but there are still some children left, hoping for a forever family.